Ram (Samrat Reddy) is murdered at selfie point and his wife Deeksha (Lakshmi Manchu) lodges a police complaint . Fed up with the lethargic response from cops, Deeksha decides to investigate it herself. With the help of an enthusiastic constable Chary (Priyadarshi), she cracks the case and finds out the murderer. Rest of the story is all about how she delivers justice for herself. Actors: Lakshmi Manchu selects an interesting script and essays the lead role well. She is present in the 90% of the film as the entire story revolves around her and it’s narrated from her point of view. She has done very well in emotional episodes by showing vulnerability. Priyadarshi is good and gives us much needed relief in this serious thriller. Stage actor turned film actor Dr. Srikanth Iyengar plays the role of a bad cop convincingly. Adarsh Balakrishna does the role of a rich brat and he is very good. Samrat Reddy is okay. Story - screenplay - direction: The basic storyline resembles that of a Hindi blockbuster (I am not mentioning the name of the film as it might give away the thrill factor if you decide to watch this film). Screenplay by the debutant director Vijay Yelakanti is effective. He has done okay as a director, but has issues with pacing of the film. The initial parts of the film are sluggish and unconvincing (especially the parts where heroine misses her slain husband and parts in which heroine does forensic work so perfectly). Other departments: There are no songs (a big relief) and background score is very good. Cinematography by Samala Bhaskar reflects the thriller mood of the film. Editing is nice. Art direction is good. Dialogues by Sandeep Ganta are fine. Production values are decent for this genre. . Analysis: The basic strength for any thriller is the screenplay. Debutant director Vijay has succeeded in that part. Thrillers are all about misleading the audiences with a different point of view and then reveal the real story in the climax. Climax of the film is pretty good. However, the narration is slow and some parts of the film are unconvincing. 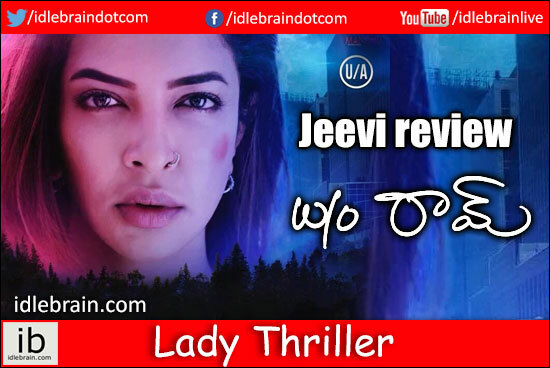 After Dongata, Lakshmi Manchu comes up with another thriller in the form of w/o Ram..